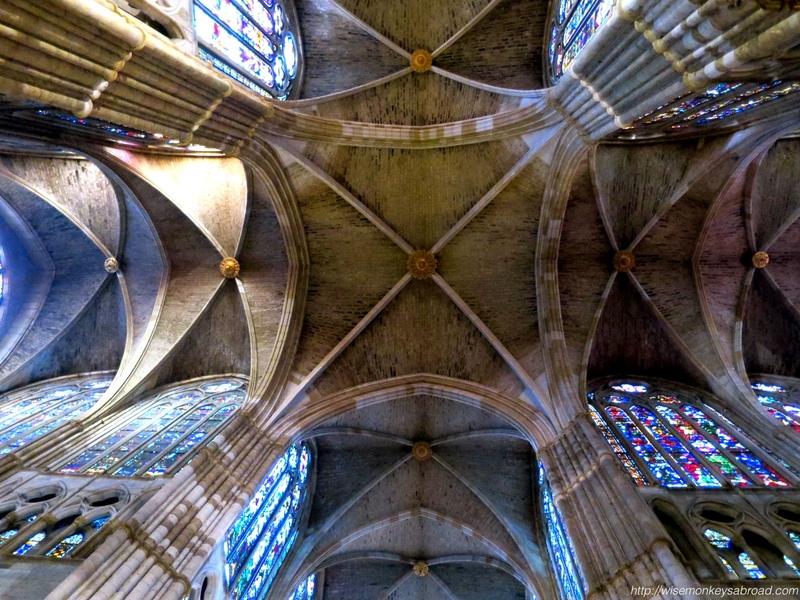 We were inside the Cathedral of Leon and when we looked up – this symmetrical view needed to be photographed. And now we get to share it for the “symmetry” challenge this week. Feel free to leave us your thoughts here. This entry was posted in Spain, Weekly Photo Challenges and tagged Architecture, Camino, Camino de Santiago, cathedral, Daily Post, Leon, looking up, Photography, postaday, symmetry, Travel, Way of St James, Weekly Photo Challenge. Thank you 🙂 It was a pretty impressive building! A stunning wonderful photo. Thanks for sharing it. Always excited to share a photo that we took and that people enjoy seeing! Thanks for your lovely comment. Cathedrals seem to exhibit a lot of symmetry reflecting perhaps on the symmetry of the cross and the trinity? Great image. Hmmm…. very very good point! Glad you liked our choice for the theme…. sometimes we take photos and wonder when we would ever get to use them. That’s why we LOVE the weekly photo challenge! What a gorgeous photo! Mustn’t forget to look up. I always think how easy it would be to forget to look up to the ceiling of European cathedral – it’s so easy to get mesmerised by the interiors and windows but the ceilings, just like this one, are often full of beautiful colours and shapes! We can’t help but look up because we just want to see the extent of these buildings… they just blow us away at how high the ceilings always were. The engineering and architecture behind them is baffling 🙂 Hope you are well! Hi Linda, thank you soooo much for your sweet comment! It is very interesting to visit cathedrals… each one has its own “personality”. Leon Cathedral was absolutely unreal!! Aren’t those European cathedrals amazing. Great photo here. It gives a wonderful impression of the height of the ceiling. I’m having a lovely at-home weekend. How about you? I can never get enough of churches, but Mr ET does weary of them after a few weeks. Each one is a little different and we have nothing like them at home. We’ve had a wonderful weekend. We took a train to the Blue Mountains today (which we HAVE never done) and it was such a great little day trip. We are sure going to do it more often. We hope you have a wonderful week ahead! Oops, pressed the wrong key on my phone and posted that comment too early. As I was saying, my sister and I travelled by train when we went to the Blue Mountains a couple of years ago. It’s such a lovely journey. We stayed for a week and it was Spring so all the cherry trees were flowering in Leura…gorgeous. Brilliant shot, Monkeys. The top of the cathedral looks stunning. Very high ceiling. Don’t know about the two of you, but sometimes I get dizzy when I look up at a high ceiling, and at the same time feel “wow…!”. Maybe it has something to do with not being comfortable with heights. Oh Mabel, your comments are always on such similar wavelengths! We must be kindred spirits… and it just reconfirms your honorary “wise monkey” status 🙂 Yes, looking up, always does make us feel a little odd somehow… and looking down when we are up high does the same! But we can’t help but want to do both all the time. Thanks Curt – we were simply thrilled we could share this photo! Sometimes we take a photo and wonder, “How are we ever going to use this?” 😉 Hope you are enjoying the weekend. Aha – great minds think alike. We will duck on over now to your entry and see what you did! Churches and other old buildings always give great opportunities for pictures. Need to check my camera for some pics from thr helsinki cathedral ! You are soooo right! There are so many photo opportunities… we just snap, snap and snap some more 🙂 We can NEVER take too many photos! Hope you have some pics from Helsinki Cathedral that you can share. I took some photos in this cathedral but believe me, none of them came close to what you’ve captured here. Beautiful! !